My meadow in late May - a great success this year! And May blossoms galore. The meadow has changed radically from April to May. In April the bluebells overpowered everything else. 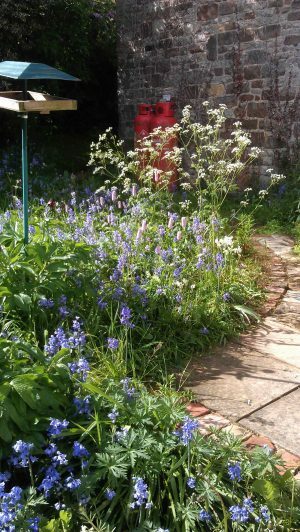 Unfortunately Spanish ones, hard to eradicate – I take care they don’t spread beyond the garden as there is a danger they cross-pollinate with our native bluebells, almost unique to Britain. In May, I am reaping the benefits of growing a lot of red campion from seed gained in the Cottage Garden Society seed swap. Never mind that I thought it was white campion, it looks great with everything else. The pink poker flowers in front are persicaria bistorta ‘Superba’, which I moved from beside the pond, as they could not tolerate the sun (along with all the other waterside plants I’ve tried except for sedge). They look very happy here in the shade of the house. Other areas look pretty romantic as well – the countryside in May is full of hawthorn blossom, and my garden ‘borrows’ this landscape. Beside this, catching the morning light, is the bench and table surrounded by lilacs in full bloom, with the rose about to come out. And the front garden is about to change over from forget-me-not to June flowers, with the apricot tree adding a lot of shiny green leaves near the front door.